NASA's Jet Propulsion Laboratory seems to be in the clearfrom the threat of a nearby wildfire, but the historic observatory atop Mt. Wilson is potentially facing a closer call. The so-called Station fire is burning in the Angeles National Forest near homes on the north side of La Ca?ada Flintridge, according tonews reports. The fire camewithin one quarter to one eighth of a mile of JPL on Saturday, but hassince retreated. Despite the lessened threat to JPL, the facility remainedclosed on Monday "except for mission-critical personnel," accordingto an update on the JPL website. The closure was made because of concerns aboutair quality. Concerns over the fire have shifted to nearby Mount Wilson,where many of the L.A. Basin's cell phone and broadcast towers, as well as thehistoric MountWilson Observatory, are located. The observatory was found in 1904 byGeorge Ellery Hale, who used the observatory to prove that sunspots are regionsof reduced temperature on the sun's surface. On Monday morning, firefighters who were working to stopthe spread of the fire were instructed to withdraw from the mountainside,and Mount Wilson employees who had been making helicopter trips to theobservatory also left, according to updates on the observatory's website. Firefighters had cleared brush from the mountain and laiddown Phos-Check fire retardant by airplane near the broadcast towers. The station fire doubled in size overnight and now coversabout 85,000 acres, according to L.A. Times reports. While the observatoryappeared doomed last night, the Times reported, brush-clearing efforts andfire-retardant drops seemed to have helped. Ryan Anderson, a graduate student at Cornell who is also aPancam Payload Downlink Lead for the Mars rovers, Spirit and Opportunity, saidvia Twitter that rover operations have been suspended for the day. "The team working on extracting Spirit from Troy is not at JPL today since a one-day delay in those operations will not impact therover," said NASA spokeswoman Veronica McGregor. JPL has also been impacted by the fire through employees whohave had to evacuatetheir homes. Astronomer Mike Brown of Caltech snappeda picture of the fire's smoke plume on Friday, from the 9th floor of theCaltech library, looking northeast towards downtown Pasadena and JPL. 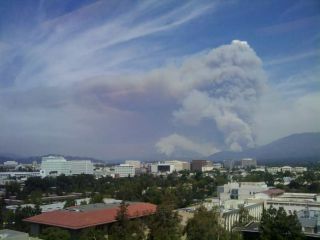 Thepicture was taken when the fire was still about 2 miles away from JPL. Airquality has improved over the day today, McGregor told SPACE.com, and JPL willdecide later whether to keep the facility closed tomorrow. "We?re monitoring the fire and the air quality and willannounce later today whether JPL will reopen to all personnel tomorrow morning,"McGregor said.